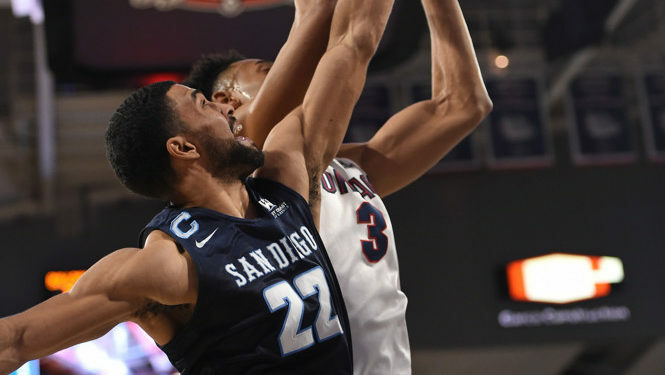 The Isaiahs are back together again Thursday as USD easily beat Portland 76-55 in Portland. Isaiah Wright hasn’t been USD’s lineup since Dec. 23 and his return immediately felt. He and Isaiah Pineiro were instrumental in building the Toreros’ 17-3 lead in the first six and a half minutes. Pineiro had his sixth double-double of the season with 14 points and 12 rebounds. USD (13-6, 2-2 West Coast Conference) was never threatened throughout the entire game even though it was without two its starters and playmakers, Olin Carter III and Alex Floresca. In their stead, Jose Martinez more than made up for it. He led the Toreros with 15 points. The closest the Pilots (7-12, 0-4) ever got was within 10 points when Portland went on a 7-0 rally on the back of Marcus Shaver Jr. at the end of the first half to close the lead to 38-28. Shaver ended the night with a team-high 21 points. Next up, USD visits St. Mary in the Bay Area at 6 p.m. Saturday.